Although the title of this page is Malinois Height and Weight, the goal of this survey is to capture statistical information on the height and weight of the Belgian Shepherd Dog, all varieties, for comparison purposes. In addition to capturing height and weight, please enter general pedigree information for your dog, ie the primary focus of the breeder and when known the country(s) your dogs ancestors are from. When considering the country, a dog who's last 3+ generations were bred in the US would be considered American lines. A dog who's mom's pedigree meets that criteria, but who's sire's pedigree is a combination of French and Belgian lines would be considered American, French and Belgian. Please do not enter data for dogs under 18 months of age, as they are not done developing and it will skew the results. For this survey working is defined as sports and jobs involving bitework (police, ringsport, etc). Performance is events such as agility, obedience, dock diving, etc. Results will be posted online once enough data has been received. If you are unsure how to accurately measure your dog, please refer to this link "how to wicket your dog". Do not estimate your dogs height or weight, as that will skew the results, making the survey useless. If however your dog runs skinny (all ribs showing) you can add a couple pounds, if the dog runs heavy, subtract a couple. All values are in standard, for a metric to standard conversion chart scroll click here. 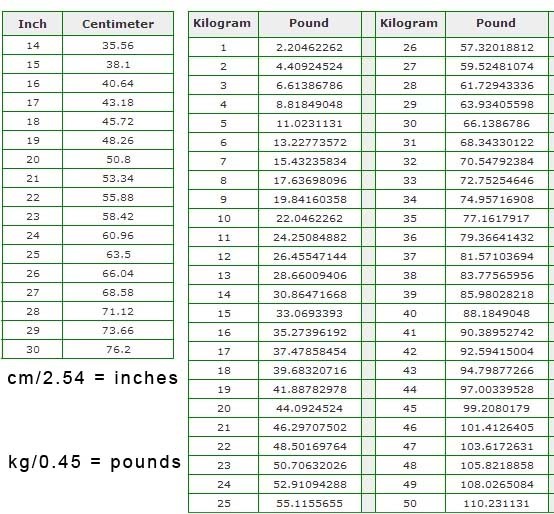 Weight and Age: These include a 100+ and 10+ meaning dogs who are 100 lbs or more, or dogs who are 10 years or older.